We could not find any information on this company, either on-line or via trade organisations. It would be great if someone could let us know more about them. We purchased these Potato Chips in TK Maxx, which provided no clues of the manufacturer's origin, but it was clearly spottable on the shelves. This would be partly because of the striking black bag. The simplicity of the line drawings also stand out well. It is fairly basic and somewhat reminiscent to Marks & Spencer bag designs. Not a bad effort considering the obvious garden market nature of the company. These Crisps were well fried in stiffening oil. This in turn meant that although thinly cut, there was a crisp and firm snappiness to them. The munch deterioration was consistent with a thinly cut Crisp, but they did not turn pulpy overly quickly. These were most certainly throwback Crisps. There was a crisp, curly and bendy structure to them that oozed historical reference. The colouring was light and bright, as you would expect from fresh and clean Olive Oil, and there was a heavy coating of oil boils all over the surfaces. 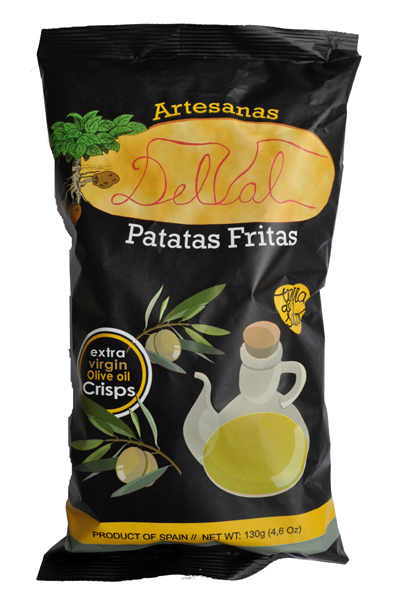 The Olive Oil that these Crisps were fried in certainly provided an interesting variation on the Plain Crisp theme. We do not profess to be the best at reviewing Plain, Ready Salted or Natural Crisps – we prefer a bit of flavour at Chips & Crisps. However, the difference the oil alone made was interesting enough to make them rewarding and enjoyable.